To clean or not to clean! 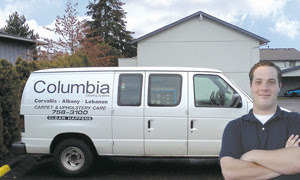 Columbia Cleaning Systems provides premium carpet & upholstery cleaning to Linn, Benton and Polk counties. Hello, my name is David Workinger and with 13 years of carpet cleaning experience, my goal is to provide the best quality or work so you can maintain a clean and healthy indoor environment. Thank your for visiting my website. I am sorry there isn't much to see at the moment. It is a work in progress. Feel free to look at some of my before and after pics/videos to see the quality of work I perform. If you have any questions or would like to schedule a free estimate, give me a call at (541) 758-3100 or send me an e-mail at columbiacleaning@hotmail.com. In many cases I usually can have time scheduled to begin cleaning immediately after the estimate if you would like me to.